Maybe it just seems that it has to be a simple process because the definition is simple. Or maybe people really just don’t care about the particulars despite having formed an evidence-based opinion. Either way, few layfolk actually understand the process and it’s not that difficult to understand. And when you fully understand it, it’s very easy to use to your advantage. As with everything these days, there’s a firm dichotomy on what you should believe about detox. You either absolutely need to do it once a month or you’ll be sorry, or paying attention to it’s a complete waste of time. And there are opinions on both sides of the aisle that are flat wrong. There’s a vast amount of evidence in the scientific literature on this topic, and for good reason. Pharmaceutical companies have spent bazillions of dollars researching it because pharmaceutical drugs are processed in the exact same way that toxic substances are. Even steroid hormones your own body makes are processed this way. There is tremendous utility in understand the detoxification process if you are experiencing an unexplained set of symptoms or a chronic illness. There are numerous components of processed as well as unprocessed whole foods that can change the way your body interacts with “toxins” as well as pharmaceutical drugs. Both drugs and toxins are referred to as xenobiotics, molecules that are not native to your own body. Typically these xenobiotics are processed and sent packing by the 3 phases of detoxification, but many seemingly innocuous foods can alter these processes. A great example is grapefruit, which is known to inhibit an enzyme that carries out the “detoxification” of many toxins and pharmaceutical drugs. As a result, many drugs carry a warning against the consumption of grapefruit because it can causes a dangerous accumulation of the drug in your blood. Another great one is polysorbate 80, a common emulsifier used in processed foods. Polysorbate 80 inhibits a highly used transporter responsible for removing toxins from cells(1). Polysorbate 80 has also been shown to induce colitis in mice(2). In my opinion, some food intolerances may not be due to an intolerance specifically to that food. Instead, certain components of food may interact with the detoxification process causing an accumulation of xenobiotics that may cause a bad reaction. Understanding detoxification and how your diet interacts with it may answer some questions you’re having problems answering. Despite the piles of evidence on how the detoxification process works, people still hold incorrect opinions on how it can help them. For those who believe it’s worthless, the only harm is their ignorance on the subject. But to others trying to get rid of an unexplained illness, it can bring greater symptom flares and false hope. So rather than wax poetic on the topic, let’s dig in. We’ll start with how toxins enter the body. Every day we’re exposed to a boatload of toxins. Many believe this is a product of the modern world, but our ancestors were exposed to a boatload of toxins as well. The toxins they were exposed to were different, but they were toxic nonetheless. While yesteryear’s toxins were typically bacterial, plant, or animal in origin, today’s toxins tend to be from plastics, pesticides/herbicides, and household and beauty products. Whether you’re being exposed to toxic chemicals from a flame retardant mattress or a toxin secreted by some bacterium that’s overgrowing in your gut, the process of detoxification is the same. Actually, if we want to be technical, what’s happening isn’t actually detoxification it’s biotransformation, but you probably don’t care about that. Ultimately toxins are removed from the body in the feces, urine, and sweat. These substances are all water-based, so water-soluble toxins are sent packing efficiently by each of those methods. Another “bonus” of water-soluble toxins is that you don’t tend to absorb them very well. The lungs, gut, and skin are all water-tight barriers composed of cells with a fatty cell membrane. This means that anything water-soluble remains out of the blood unless the cells making up these barriers have transporters or channels that bring them in to cells. For example, many water-soluble vitamins have transporters that carry them in to cells. Sodium and glucose have transporters that carry them in to cells. Almost anything physiologically important to you that’s water-based has a specific transporter that carries it in to or across the cell. This doesn’t mean that water-soluble toxins can’t get in, but if they do they’re easy to get rid of anyway because they’re already water soluble. But what about fat-soluble toxins, what’s the deal with them? Fat-soluble toxins that are small enough can freely enter cells because they can diffuse through the fat-based cell membrane. This isn’t an ideal situation. When a fat-soluble toxins enters a cell it can damage them or even kill it. They can also traverse through a cell and into the blood if not caught in time. Fortunately we have a pretty solid means of dealing with them, both at the organ and cellular level. For simplicity sake, let’s pick a typical route of toxin exposure, the gut. Let’s say you have some form of bacterial overgrowth in your gut and this bacteria is secreting a fat-soluble toxin. If it were water-soluble it would come in to contact with the epithelial cells that form your gut wall and get turned away. But since it’s fat-soluble, it just diffuses through the membrane and enters the cell. The epithelial cells that make up the gut wall are pretty excellent at what they do. They, along with cells of the liver, are the best equipped to deal with fat soluble toxins because the cellular machinery is there in spades. If everything goes peachy-keen, the gut cell converts the fat soluble toxin in to a water-soluble molecule and pumps it back in to the gut to be removed in the feces. Since it’s now water-soluble, it can no longer enter cells of your gut. Bacteria can muck up the process by deconjugating the toxin so that it’s fat-soluble again, but we’ll cover that in a later blog. This process is great, but not 100% efficient. Some fat-soluble toxins manage to slip through the gut cell and enter the blood. Luckily, the vein they happen to enter just so happens to go directly to the liver, the portal vein. Once in the liver, the fat-soluble toxin enters cells there and gets converted into a water-soluble molecule. From there it either enters the gallbladder and gets secreted back in to the gut via the bile or enters the circulation and leaves in the urine. Again, not an infallible system but a great system nonetheless. The problem is you can absolutely exceed this systems ability to process fat soluble toxins many ways. First, a leaky gut not only removes the barrier, but it also removes the first line of cells that would process the fat-soluble toxin. Second, inflammation in the gut inhibits the detoxification process. We know this happens because people with inflammatory bowel disease have defective detoxification pathways and have altered metabolism of pharmaceutical drugs. Third, certain food components can inhibit different phases of detoxification. For example, grapefruit can inhibit phase 1 detoxification as well as phase 3. Turmeric can inhibit phase 1 detoxification as well, which we’ll cover a little later. Finally, certain nutrients power all of these processes and they’re not infinitely available. Relying on specific pathways too much can deplete your ability to use that pathway. There are 3 phases of detoxification and each phase has multiple pathways to deal with a specific toxin. For example, the second phase involves adding something to the toxin to make it water soluble. If you’re chronically exposed to something that relies on a specific pathway, and some other toxin exclusively uses the same pathway as well, that toxin can accumulate. And even though your trainer told you that the accumulation of toxins doesn’t happen, we inarguably know that it does. Let’s take a look at how. 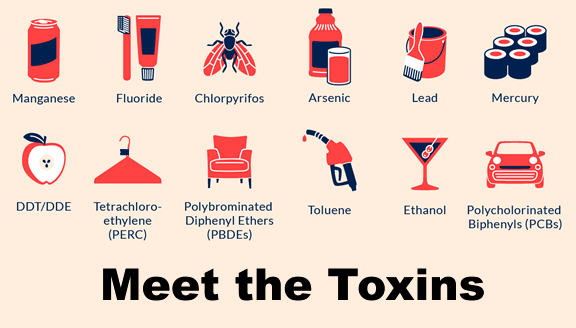 In general, many toxins accumulate basically everywhere. I don’t mean everywhere in the human body, I mean everywhere in the world. These toxins accumulate in the soil, food chain, and even in the fat tissue of animals. Since they don’t biodegrade, they are often referred to as persistent organic pollutants(POPs). Since these toxins don’t biodegrade, they accumulate in the soil. Since plants get their nutrition from the soil, many of these make their way in to the plant and some simply get consumed when an animals consumes the soil surrounding a plant. A great example of this is polychlorinated biphenyls, which were banned in 1979 but are still found in the soil and food chain. These POPs are fat soluble, so they tend to accumulate in the fat of animals. So when you eat that hamburger that was once a cow that grazed on land containing PCBs, you absorb the PCB metabolites that cow had stored in its fat tissue. And when you kick the bucket and bacteria degrade you, the PCB makes its way back in to the soil. So you are exposed to a significant number of toxins through the food chain. Once these fat soluble toxins enter your gut, they need to be processed or shunted away in fat before they pile up in the blood and overload the liver. But where’s the evidence that this happens? Multiple lines of evidence point to the accumulation of toxins in fat tissue. First, studies that have sampled human fat tissue find the presence of pesticide residue metabolites(3, 4) and plastics(5, 6). If the gut and liver were completely capable of processing these toxins, we wouldn’t find them stored away in fat tissue. But that’s not all. Over time, these toxins are slowly released in to the bloodstream from fat tissue, at levels tolerable to us, for further processing. The ultimate goal is to cnvert them in to water-soluble metabolites and send them packing. Unfortunately, if you’re trying to lose weight, the metabolism of fat tissue that happens with fat loss can cause these toxins to get released more rapidly(7, 8). Even if you thought these studies were fraught with tainted samples, there’s a common example of how this happens. When you take a drug test for a job, the test relies on this process to determine if you’ve used marijuana recently. THC, the active component of marijuana, is fat-soluble. Since it’s fat-soluble, it shows up in your urine for days to months after you last used it. That’s because it gets stored away in your fat cells and released over time, as mentioned above. Once released, it goes to the liver, gets converted to something that’s water soluble, re-released into the blood or lymph, and dumped in the urine. So the test isn’t only measuring whether you’ve smoked marijuana, it’s also measuring how effectively you use that particular set of detoxification pathways. You pee in a cup and pass or fail depending on the efficacy of the 3 phase detoxification process. Factors that determine this are how much fat you carry, how often you smoke marijuana, how long it’s been since you last smoked, and how well these pathways are running. This system is fantastic in its simplicity and is no different whether you’re dealing with pot, pesticides, or plastics. So let’s further examine the 3 phase process of detoxification. Going back to our example of a bacterial overgrowth secreting a toxin, let’s look at the precise ways that this toxin gets dealt with. The first step in understanding begins once the fat-soluble toxin diffuses through the cell membrane and into the cell. In this illustration, ligand refers to something that binds to a receptor. For our purposes, ligand refers specifically to a fat-soluble toxin. Other potential ligands include pharmaceutical drugs, hormones, metabolites from commensal bacteria, and certain components found in food. Pregnane X receptor(PXR)-Ligands include many pharmaceutical drugs and pesticides, endogenous steroid hormones, bile acids, and antibiotics. Constitutive androstane receptor(CAR)-Ligands include certain pharmaceutical drugs and pesticides, DHEA, bilirubin, bile acids, and phenobabrital. Aryl hydrocarbon receptor(AHR)-Ligands include components of plastics and bilirubin. All 3 receptors also have ligands that bind polyphenols in food and metabolites from commensal bacteria. These receptors are held in the cytoplasm until a ligand binds to them. Upon binding, the receptors carry the ligand to the nucleus and initiate some combination of the 3 phases of detoxification. Once the receptor chaperones the ligand to the nucleus, gene expression is altered in a way that promotes the conversion of the fat-soluble ligand in to a water-soluble molecule and removes it from the cell. This is done by upregulating genes that perform the 3 phases of detoxification. Phase 1 detoxification(Oxidation, reduction and hydrolysis)-Phase 1 detoxification is mostly carried out by cytochrome p450(CYP450) enzymes, of which humans have 43 different types. Each CYP450 metabolizes a specific set of xenobiotics. Ligands can activate and/or deactivate a number of CYP450 enzymes when carried to the nucleus. The purpose of phase 1 detoxification is to make the ligand more water-soluble or to make it compatible with phase 2 detoxification. Sometimes, the products of phase 1 detoxification are actually more toxic than the original ligand, but they are either more water-soluble or compatible with phase 2. Phase 2 detoxification(Conjugation)-Phase 2 detoxification involves conjugation of the ligand with a charged substrate. The 6 processes that are involved in phase 2 detoxification are methylation, sulphation, acetylation, glucuronidation, glutathione conjugation, and glycine conjugation. Depending on the ligand bound to the receptor, the appropriate phase 2 enzyme is induced to turn the ligand fully water-soluble and non-toxic. The particular enzyme that gets induced depends on the shape of the molecule being compatible with the particular enzyme. Ligands can either directly enter phase 2 if they have the proper conformation or must enter phase 1 first to make them compatible. Phase 3 detoxification(Transport)-After phase 2 detoxification, the product molecule is fully water-soluble and can be released from the cell. During phase 3 detoxification, the molecule binds to a transport receptor that kicks the molecule out of the cell and either in to the bloodstream or back in to the gut. P-glycoprotein, one of the primary phase 3 transporters, is responsible for pumping toxins back in to the gut for elimination in feces. It also sends toxins from the liver in to the gallbladder for excretion in bile. So, as you can see, the basics of detoxification at the cellular level are actually quite simple. First, a fat-soluble xenobiotic diffuses across the cell membrane of a cell and enters the cytoplasm. Once there, it floats around until it comes in to contact with a receptor that binds it. Once bound to the receptor, the xenobiotic is chaperoned to the nucleus where some combination of the 3 phases of detoxification turn it water-soluble and spit it out. If everything worked out perfectly, cells would literally spit out toxins as they encounter them. Unfortunately that’s almost never the case. Some toxins can accumulate in the blood or tissues, which is in agreement with findings showing metabolites of toxins in fat tissue. Sometimes toxins get through the gut and liver, or enter through the skin or lungs. Fortunately many cell types express a high level of xenobiotic receptors to help prevent major problems. The lungs, liver, gut, and kidneys are all highly capable of transforming fat-soluble toxins in to water-soluble metabolites and kicking them out of the body. A toxin may begin transformation in the gut, make it to the liver, and enter the general circulation only to be kicked out in the urine via the kidneys. A toxin may somehow bypass all security systems and make it in to cells of the blood brain barrier where it binds PXR and gets kicked out by P-glycoprotein. Some toxins, particularly ones absorbed through the skin like bisphenol A(BPA), may get partially metabolized, stored away in fat, and released when you sweat(9). You encounter many toxins every day and each is dealt with in a specific manner. In general, I don’t think this is something you need to go crazy over. However, if you have a reason to believe you have symptoms that are caused by an accumulation of toxins, the standard cleanse/detox approach is probably not the best option. It would be great if optimizing detoxification were as simple as throwing a bunch of turmeric at it, but it’s nowhere near that simple. In fact, I consider turmeric/curcumin a perfect example of why the general shotgun approach is probably not the best for most people. Curcuminoids, the active constituents of turmeric, activate the pregnane X receptor and induce phase 2 detoxification. This is great, but at the same time they block phase 1 detoxification. In this situation, turmeric will speed up the processing of toxins that can go right in to phase 2 detoxification, but impede the detoxification of toxins that must go through phase 1 detoxification first. Another problem with turmeric is that it’ s typically taken with piperine to enhance absorption from the gut. On their own, curcuminoids are quickly “detoxified” in epithelial cells and spit back in to the gut by P-glycoprotein. Piperine works by blocking P-glycoprotein, which is probably not something you want to do if you’re trying to prevent the absorption of toxins from the gut. It’s great for improving the absorption of turmeric from the gut, though. Overall, you have a pretty good capacity to detoxify the many xenobiotic compounds you come in to contact with. Despite this fact, toxins can become problematic and accumulate in the blood and fat. During periods of fasting and weight loss, these toxins can be slowly released in to the blood and affect physiology. This is particularly concerning for endocrine disruptors such as BPA and PCBs which mimic hormones. This by no means gives credence to the popular cleanses/detoxes that precede many diet programs. Throwing a bunch of random nutrients that all induce and inhibit different detoxification enzymes probably won’t do much, and even if it does it’s probably as likely to create a problem than to solve it. Did this blog scratch an itch? Are you looking for something a little more…usable for you? Well, I’m thinking of generating a pre-tox checklist, basically a to-do list to get started on using the science of detoxification to your advantage. Buuuut…I need a little motivation. You see, it takes a loooooooooong time to write these blogs and I want my readership up. So, I just need you to do 2 things to motivate me. First, like my facebook page here. Second, share this article from there so others can read it. I have a number of “likes” and “shares” in my head that I want to reach. If I hit that number, I’ll make this pre-tox checklist public. If not, I feel like I gotta pay you somehow…So I’ll send it to anyone who likes the page and shares the article. I’ll give it 2 weeks, so please, like and share. Hey Karen, I never really saw any interest so I never moved forward with the pre-tox checklist. What is it you are looking to do and maybe I can point you in the right direction if I have any blogs to help? At this point I’ve moved most of my private blogs public that would contain that info so everyone has access. Thanks for reading and sharing! Thank you for this very insightful article and great website too. You’ve really done a great job and research for this topic about detoxification. Good job.